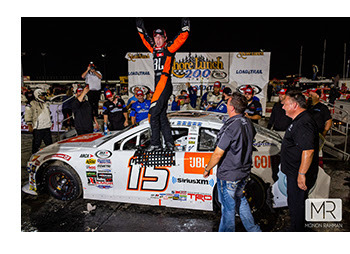 Concord, North Carolina (October 8, 2018) – Christian Eckes, driving his familiar No.15 JBL Audio Toyota, scored his third career ARCA Racing Series presented by Menards victory with a dominant performance in Saturday’s Shore Lunch 200 at Lucas Oil Speedway. Eckes, one of Toyota’s highly touted TD2 drivers, started from the pole position after setting a track record in qualifying and led 171 of 200 laps on the night. Putting an exclamation point on what can only be defined as a break out season driving for Venturini Motorsports (VMS), Saturday’s Indianapolis race marked the 13th and final ARCA appearance of the year for the Middletown, New York native. Eckes, making his ARCA series debut in 2016, made the most of his third consecutive season driving part-time for VMS. 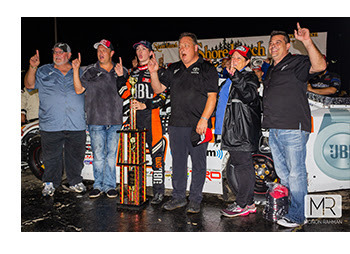 Continuing to improve from year-to-year, Eckes’ 2018 performance with three wins (Salem Speedway, Springfield and Lucas Oil Raceway), two General Tire Pole Awards (Elko Speedway, Lucas Oil Raceway) and 421-laps led throughout the season, helps thrust the 17-year old driver back into conversation as one of the brightest up and coming young drivers in the sport today. Adding to his overall statistics, Eckes with three victories and two pole positions, has earned 10 top-5 and 18 top-10 finishes with 695 laps led in 27 ARCA career starts. With his ARCA season in the rear view mirror, Eckes will now shift his focus to the NASCAR Camping World Truck Series where he’ll reunite with Kyle Busch Motorsports for two more starts behind the wheel of his No.46 Toyota Tundra at Martinsville Speedway on October 27 and ISM Raceway in Arizona on November 9. With two NCWTS career starts both coming this season, Eckes earned a top-10 finish in his debut at Iowa Speedway and a stage win at Gateway Motorsports Park. Although Christian will not be competing the final race of the season is up next with the Kansas 150 at Kansas Speedway. Teammate Michael Self will take over the driving duties of the No.15 Toyota at Kansas. The fifteen-team, currently in second-place in the owner point standings will look to close out the year the way they started, with a win. The race will air live on FOX SPORTS 1 on Friday, October 19.